The halo overhead tube support is a heavy duty, hospital grade, manually operated, fully counterbalanced ceiling mounted unit. Made In The U.S.A. 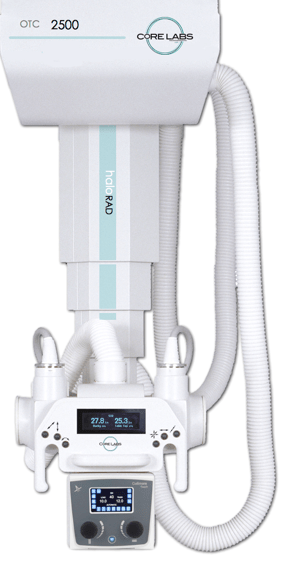 The halo tube support provides fexibility to facilitate a wide range of x-ray procedures. Fully counterbalanced’ this heavy-duty system can be easily positioned at any selected point within its total range of travel. The x-ray tube rotates a full 360-degrees about its vertical and horizontal axis with mechanical indexing at each 90 degree position. The ergonomic operator control panel provides convenient selections to allow the tube to be moved in the longitudinal, transversal, vertical and rotational directions, and allows for table/wall bucky centering. A single handle control allows for fast and out of the way positioning& Clean’ carefully laid out cable management. 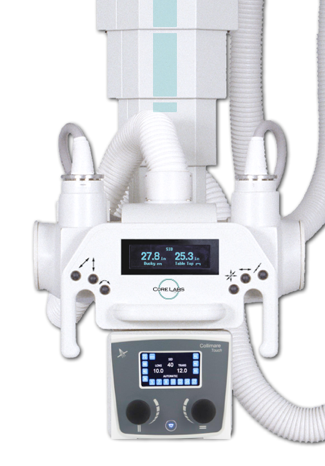 The LCD Display indicates SID to tabletop/wall bucky in inches or centimeters(!calibrated at installation) and angulation of x-ray tube in degrees. Platform mount is standard’ and a 10″ orthopedic column extension is optional.